Is Mourinho finished at Real Madrid? If you believe the hype, Jose Mourinho is on his way out of Real Madrid. According to various reports and sources close to the Portuguese manager, he has had enough of dealing with the local press and the alleged discontent from the Spanish contingent in the dressing room and is ready to walk out at the end of this season. Is this true? Yes and no. I think he will quit the Santiago Bernabeu in June, but not for the reasons which have been circulating in the media over the last few days. Let me start by explaining why there is tension at Real right now, ahead of Wednesday's Spanish Cup quarterfinal clash with great rivals Barcelona. Before this season started, the club’s sporting director Jorge Valdano was sacked. Mourinho didn’t see eye to eye with the Argentine and convinced Real president Florentino Perez that the team and the institution would be better without him. This meant that the two-time UEFA Champions League winner had complete control of every football decision at the club. Not only was he in charge of tactics and the purchase of players, but he also had the independence to do and say whatever he wanted in the name of a club that has won the European title a record nine times - but not since 2002. As great as this was for Mourinho, it didn’t please many senior members at Real Madrid, who believed he had proven to be too much of a loose cannon for his own good. They voiced their disapproval internally, but Perez stuck with his plan and gave Jose free rein. There were various episodes this season which created more discontent among long-serving directors at Real: the eye-poking incident against Barcelona in the Spanish Super Cup, the comments he made about wanting to return to England - and the back-to-back defeats to Barca in the league in December and then in last week's first leg of the cup quarterfinal. Not necessarily the results, but the defensive and aggressive way in which the team played did not please the institution. Portugal defender Pepe's stamp on the hand of Lionel Messi last Wednesday is one such example. In my view, what has happened recently is that some people at the club have used their connections with local sports newspapers like Marca and As to persuade them to run stories about player discontent. The purpose, of course, is to increase the pressure on Mourinho and convince some of the fans that he is not as special as they once thought he was. These Real heavyweights have also probably encouraged some of the players to stand up for the old-school values of the club and take a stand against the manager. So what about the reported row between Real defender Sergio Ramos and Mourinho, and the alleged dressing-room split between Spanish and Portuguese players? It is my belief that the argument happened, but I don’t read into it more than that. Mourinho is a manager who has always inspired and motivated his players, and even if there was unrest among a faction of the team, I would be shocked if they were to lead a mutiny against him. After all, this is a side leading the Spanish league by five points, setting records for points and goals, and easily qualified for the Champions League knockout stages. So there is no real proof that the players are not behind their coach and that they will not continue to fight for him this season. Which leads me to Mourinho’s future. Even though there is no obvious clue regarding what the former Porto, Chelsea and Inter Milan boss will do next, and even if there is no mutiny within the squad, I still sense he will leave Madrid at the end of this season. The 48-year-old feels betrayed and also feels that all the work he has done is not being appreciated. He thinks the current Barcelona side is probably the best of all time and that if his rivals weren’t this good, he would comfortably be winning titles in Spain and Europe. Therefore my prediction is he will leave Spain behind in June and move to England to manage Manchester City. I know it is a bold call, but I believe it will happen. Even if Mourinho wins La Liga or any other trophy in Madrid, he will satisfy his desire to return to England to take on a project that would be as challenging as any he has ever undertaken in his career. He would be the perfect choice to take over from Roberto Mancini, who will be sacked when City fail to win the Premier League title this season. Very brave prediction, Pedro. I like the bit about "when City fail to win the Premier League this season". Amen to that. I hope they sack him sooner. I wana see him humiliated and I think if F.C. Barcelona lay down a nice La Manita style smack down tomorrow hes finished. He can just pack his bags straight from Barcelona to Manchester. "(..)Roberto Mancini, who will be sacked when City fail to win the Premier League title this season." When or if? Can you predict the future? The ongoing bad results seem to have dented his desires to keep on managing Real Madrid. Of course, he is not finished. On the contrary, he 's a very competent trainer. This is just a bad moment. Let's not be so rude to Mourinho.He has his defects but plenty of qualities too , which doesn't mean I approve of his eye poking gesture.He feels nostalgia for the Premier League, let him return to his past love. Bold predictions Pedro, except that Mancini will not be fired by Man-City. My crystal ball tells me yes he will leave Madrid- but he will not be fired. Madrid know he is the best placed person to offer any meaningful challenge to Barca. he will leave on his own volition out of frustration as he does not know how to lose and truth be told Barca are unbeatable. My crystal ball further tells me that AVB will is the one to be fired by Chelsea and Abramovich, who has been looking for a Mourinho clone- look at AVB- would rather have the real thing back and suffer a bruised ego than keep Chelsea at mediocre levels will gladly take him back. Lets wait and see who's crystal ball shows clearer! Is Mourinho really close to call at Madrid? CNN's Pedro Pinto's analysis could spark irks! Man City's Mancini to be sacked is a slim fine chance.. and not that robust as Pedro could opine. Mancini most likely will not be backing down in the fight for the league, so he may not be sacked after all by City...and that lead me to asking Pedro, where then will Mourinho ply his next trade come next season? I think he will stay with Madrid. Numbers speak for themselves and the team is entertaining, averaging 3.8 goals a game. They won' tsack him purely because of the games against barcelona. That's more of a trait of the Catalans given their wish to be seperated from Spain. If he wins the CL – he will be appreciated by everyone. Mourinho will leave Spain but not just for the reasons you suggest. I believe coaching in a two team league where his team is 2nd best no matter what due to the God-like status bestowed on Barcelona is wearing thin on the Special One. England is a bigger stage and Mourinho knows it, therefore he wants to get back in the mix. I'm sure he'd like to manage United but Fergie's staying put, and I don't believe there'll be a vacancy at City because Mancini's men will win the Premier League. Why you think otherwise is puzzling as all the top teams lack consistency so surely the team in front has a good chance of staying there. Mourinho will therefore need to find another home which I believe will be in North London, either as Wenger's long overdue replacement at Arsenal in the wake of yet another barren season or as Redknapp's replacement at Spurs, either as a result of Harry succeeding Capello as England boss or as a result of sanctions if he's convicted of tax evasion. Either way, Mourinho starts next season in the BPL. is this question for real? best Real Madrid record since ever in the championship. still in European champions league, best coordinate attack of Real Madrid since ever, more goals in the first half of championship since ever, loses one game against Barcelona and they question him? that's just stupidity!! Mourinho is the best coach of our time! C'mon, Even If he will leave, definitely, definitely, definitely not City. It would be very stupid for Madrid to axe Mourinho. The job he has done is amazing. When he got there, there were lots of egos and they were vastly underachieving. Right now, there is only one team better than Madrid...Barcelona. But look at the 2 year pattern. He wins copa del rey the first year and may very well win La Liga this year. Anyone who thinks they are struggling is an idiot. In two year time Jose mourinho will leave Madrid and we all know he love bigger challenges trust me nothing excite him more that the big task of bring Liverpool back to the top of the world but be patient it will be in summer of 2014. Why don't you stop making excuses for Mourinho and except the fact that he failed at what he was hired to do: beat Barcelona. His tactics off and on the pitch stink and he leaves a lot to be desired as a person. yess his time is finished there and better for him to continue at catania or torina lol. Blasphemy, Mr. Pinto... utter blasphemy. Unless Mourinho wins the UCL, he is not moving to any other club. Period! If he win one of the throphy, he should stay. How do u see that Madrid are not achieving with mou? Madrid used to get eliminated in the second round of champions league every season and used to get beaten by third division teams in the cup. Ronaldo is the golden boot winner. So what so u want more? Madrid plays entertaining football am scores lots of goals each match. So if u compare Madrid of mou with ,Madrid of older times u will see how better they are now. Mourinho is still SPECIAL ONE. After all, he's the only Madrid coach to lose to Barcelona record 5 times in less than two years!!! Mourinho please come to Liverpool, we need someone special. One other thing Pedro, Mourinho will never go to Man City... his next stop will be the Old Trafford. That's my story, and I'm sticking to it, kind sir! One is tempted to point at racism in spain, because mou has been citized from the very fist day he got into spain. All the players he bought were flop before they proof themselves for the Spaniards to see. Di maria was too expensive and not worth to play at real madrid, coentrao the same. It is obvious when you read the spainish press that others are always responsible for the fault in madrid and never the spaniards. Its horrible. Anyway, I hope mou uses his change management skills and over come this crude people. its a ball game,by rules when de canoe goes down we all go down. Pedro, with a little more info your report will be great. You forget to mention that the R. Madrid has this year been blamed that the referees are worry to be sack fi they make a mistahe againt de RMadrid, and that after 19 games the R.Madrid has receiveid the gift of 9 penalties, most of them at the right time when games were open. That Cristiano Ronaldo good numbers (23 goals) are really 14 goals + 9 goals from penalties. That the claim is that once more the referees are using a different rule when they are facing the R. Madrid. And that the Morinho team seams to be granted the right to play more than a sports contact with fouls that should be punished going free. to win is to lose,to lose is to win. Mancini will be sacked if City fail to win the Premier League? That's certainly a bold call. There's almost half the season left to play but for all their so-called recent troubles, they're still top and have been for a while. I don't support them, but I admire how far they've come even if it IS largely 'bought success'. The best manager of his time. The best of best. Fire him madrid and you are done. Jose is special. The Best Current Manager In The World!! !, Look How Man Utd Had To Step Up When He Took Charge Of Chelsea, Before He Was There The EPL Was Really A One Horse Race. And When He Took Over Inter, They Won Everything, Now Look At Inter Now There Not The Same Team Who Won The CPL Recently. As For Madrid They Have Not Played This Good For Decades, Even When The Galacticos Were Around!! Article well written Mr. Pinto but the truth is, unless mou achieves his aim at madrid i don't see him leaving the club in the nearest future. My prediction is, mou will go back to chelsea and he shall be left to take full charge of all the club activities this time around. Mourinho is useless. He teaches to play dirty and has never played clean. get rid of him !! Don't like your point at all! You put in your article to many subjective opinion, because you adore Jose Mourinho! I think that you as one of the best sport reporters in the world should know to set the limits of admiration of Real Madrid and Mourinho and to be objective as you once was! Remember what happened to la manita of Sauron? Just wait for the day the devil worshippers of Barcelona will get their ring of power cut away from them. what if Mancini win the Premier League title this season? Then Mourinho will be in Limbo. Please tell us. I think you are the one who knows what will happen in the future. If the Special One wants a challenge, he would take over Liverpool and turn the club around 180 degrees. There's not much of a challenge when you can have all the money in the world to manage oil-rich City. The Arab owners of Man City would love to have someone of Mourinho's reputation. Imagine what Mourinho's presence will do to the rising brand of Man City. He will only elevate it further. With him around, they will be selling a lot of jerseys around the world. City will be in a position to join football's global brands...Real, Man U, Barca, Arsenal, Liv'pool. He "Mourinho" would be the perfect choice to take over from Roberto Mancini, who will be sacked when City fail to win the Premier League title this season. Sacking Mourinho just because he could not break Barca's stranglehold right now is plain stupid. You are practically saying that Sir Alex Ferguson was to be fired as well back in the old days when he failed to break Liverpool's dominance in the early stages of his ManUtd's life. Mourinho has taken Real Madrid to gutter levels. He has instilled tactics that embarrass many of us former fans. He has traded the club's high values for cheap intrigue. He has brought shame, not glory. I do hope he is fired (soon!) so that the entire club can be rebuilt in the spirit of former coach Del Bosque. Until that happens, I hope this small man with enormous ego continues be taught humility lessons over and over by his nemesis, Mr. Guardiola. So the man can't find a way to beat 1 single team Barcelona and the press gang up on him? He defeats the other 99% with ease and they still want his head? Seriously, if this guy parts the sea to Ibiza they will still complain the lane is too narrow and want him sacked. Nice idea Pedro but I will have to disagree with you. If he goes to Mancity he will never be able to manage Man Utd. Which let's face it, is his destiny. I reckon he will be taking over Man Utd. From Sir Alex within 5 years. Good riddance ! I was never a fan of Madrid & never will be but it's obvious that he encourages their dirty play , so much for a professional coach! Barca all the way ! I agree Jose has many reasons to leave in June, but he sure as hell won't be going to City. Mancini is safe with or without the PL title. Jose was brought in to beat Barca and has failed. He is a great coach. If he is available, Mancini would be fired even if he wins the EPL. So it is City for the EPL, Jose for Chelsea. It is undeniably an act of the media in connection to many to end the reign of Jose at Real Madrid. Prior to his tenure the team had not experienced record-breaking points, nor victories as such under Pellegrini and his predecessors. Facts and statistics prove him to be indeed special. He is in the process of building a team (just like it took Barcelona years to achieve). So a little patience, faith, and appreciation goes out to Jose Antonio Mourinho. Getting rid of Mou will be the biggest mistake Real will make. If he decides to leave then that is another thing. I feel he will move back to England and surprise most people by joining Tottenham especially if Arry leaves to take up England's national team. What a joke to describe the Mancester City job as `challenging'. A 12-year-old kid could win the league with that kind of spending. Deciding which first team international to deploy is pretty much like his job now. This is typical of the human factor. Most times extraordinary success breeds pride and pressure, which in turn leads to wanton failure. Jose get your act together before it's too late. Do your job and allow others to do theirs. Real is the graveyard of stars "both players and managers", it has always been this way, so if Mourinho can flee himself out, that would be better for his career. Haha you will be wrong again Pedro! Man City will finish the job & Spain will win Euro again (not Germany as you announced on the program). Thanks for the kiss of death though... And nice try ManUsupporter, I know you are Patrick Snell! Love the show guys, watch daily, keep it up!... And how about some love for Montpellier & Udinese? Still there within striking distance of their league top positions, but no mention on the show... Wait, strike that, please keep ignoring/underestimating them. It's been working perfectly so far! i partly agree ,he 'll move maybe to man city the more probable destination as ferguson is not letting go but chelsea would be tempted considering the utter poor show by his so clone AVB . all this will depend on guardiola's availability for chelsea. pedro u should be ashamed of ur self cos u always protect mourinho and portuguese players all bcos u re from portugal,your sense of patrotism has beclouded your sense of reasoning. 2)Organise his midfield in a 4-5-1 formation. 3)Kaka should never be left on the bench when fully fit..don't forget he's a player with class. With this barca will be defeated cos he already did that in. The past!! A very intelligent article, Pedro. Quite bold but intelligent. I agree with on the fact that Manchester City will not win the EPL. I believe Mourinho might just win a cup or two this season in Spain but that it won't stop him from leaving Real Madrid. He is a proud man and he won't be too keen to work within a setup that does not fully appreciate his role and what he has achieved at Real Madrid. A huge fan of CNN and the World Sport programme. I think it will be a great loss for madrid. Reason 1. Madrid have played Barca much better under Jose in last season and this[barring the humiliating defeat] then the last few years. Reason 2. Jose is a great tactical manager. I mean c'mon guys he got e UEFA champions league title over Barca. Many commentators will rather play safe making predictions closer to the end of the season. Not Mr. Pedro Pinto though. One of the things I respect in him. I'll put my mortgage on Mourinho joining Man City at the end of this season and for the reasons in the article. I know many people who actually understand the game think the same. City's ambitions, given the resources at club's disposal, deserve a better manager than Mancini and YES I don't think they'll win the EPL. It would only be natural to go for the best available. They'll probably set a new salary record for a football manager in the process. Real Madrid has become more of a political party than a football team and that's why it is almost unmanageable. I believe JM will win something this season and leave. He is not the type to stay where he is not happy. What manager would believe he could possibly gain the approval of the Real crowd .They run the club not the manager,Jose is leading his team to the Spanish championship they want to show him he is not in charge.If ever there is a poison chalice in football its the Real Madrid job. They (the fans) only care about beating Barcelona,the continuing run of the Spanish super club has blinded the Madrid terraces with envy and hate.History shows that no manager can win with this lot over unless he can beat the Catalans home and away and win everything going like the old days,i hope their torment goes on forever,Jose is no mug he holds the club and fans in contempt and who can blame him. Pedro, can't see how taking the City job can possibly be the most challenging Jose's ever undertaken – given Sheik Mansours limitless funding. Perhaps if the Sheik left and City had to live off their own income it would be an impossible job! Someone should please tell Sergio Ramos and Ike d Goalkeeper, that they are not indispensable, the great Raul was always doing the same thing, but today he is in Germany. Let the wise learn from issues of the past.... Mourinho is a special one, and remains so... Pedro you may be right. Always love reading Mr pedro' s articles. This particular one is pretty bold statements. I too hope Jose M leaves and learn some lessons. Being egoist and arrogant doesn't always bring success. And most important, Mr J.M. defensive and hard tackling tactics is rather killing the beautiful game of football. I agree most of ur comments except for the part ( firing of Mancini). He is doing great job. Later or sooner, we people will get chance on commenting, the end of MONOPOLY of barca. i am preety sure, coz, history shows us,¨no team were reamain unbeatable ever, how best they used to be.. its the matter of time. it´s outraged to football to comment any team are unbeatable, of course all team are beatable. Barca cant be condractiory to history, do they?so, lets wait the outcome of future. Don't think city will sack Mancini even if he donot deliver league title.Their ambition at the beginning of the season was to clinch a top four finish and they have surpassed that.But I do think Dalgish will be sacked whether mourinho shall join Liverpool will be debatable as he has made his desire to replace fergie in public. Mou is so special that hes going to Lose to Barca and still win La Liga. Being 5 Points ahead Madrid can still win it even if they lose the Clasico. But Madrid has to be perfect to achieve this. Mourinho will win at least one trophy this season. After that, anything is possible. A job at Man City would allow him to create his own team and style. I do not think he will have any problem finding an other club. The loss in this case will be for Real. My dear friends, name me one coach whose team has beaten Barcelona the past 2 seasons at a crucial stage in any of the competition. 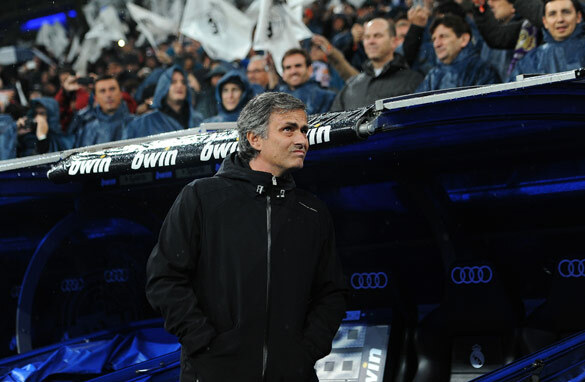 Only Mourinho has done it in the Copa del Rey final last season and in the Champions League with Inter in 2010. The fact is Real Madrid is nothing without Mourinho. If Mourinho leaves, Real Madrid will not win any competition in the next 5 years. That's my bold prediction. 'opinionchan'... You score an A+! i don't think city are in the market for a couch but if the chance of the "special one" was given i think they would take it. i think though that he would be an excellent replacement if the main man fergie was to leave. this is not such good ?journaliam? dunno what to call it, pedro, but i am disappointed in you for this. there is noone serious in the sport talking about any kind of departure for mourinho at rm.. is this some kind of joke? do ridic talk in english papers by star or usweekly type writers also carry weight with you? after such career highlights as you had last year resorting to something like this that does not even merit mentioning seemed below you? perhaps you are just below seriousness in the game?/ one doesn't get many free passes for junk like this. It is people like you that always damage Real Madrid. Who follows Madrid, prior the game of yesterday, one can already understand that this article is full of predictions – lies. Who does not follow Madrid closely, and watched game of yesterday it then comes clear that your article is again full of lies – stupid predictions. Madrid had to win yesterday, they where just unlucky, not to mention again the endless times when referees favoured Barcellona – I am referring to the unfair sending off of Ramos due to the theatrics of usual Barcellona players, Mascherano being the oscar winner of all times. While we are a this, why don't you make yourself a favour and write an article of how many times referees helped Barcellona – and the art the players have when they fall? Furthermore, Pepe conduct yesterday was clean, so for sure their was the hand of Maurinho in this case. Why don't you write instead of the yellow card of Messi? The third world player of the year, the player that when under pressure, turns out to be a bad violent looser? This is another article tip. Furthermore this also shows that you don't even follow Premier League. Maurinho will go to Manchester, but you picked the wrong team. He will join Man. Utd. after Maurinho wins the Champions League with Madrid and after Ferguson retires. Maurinho said this already and every one knows this. How come you missed it? Man. City will also win the Premier League this season, and Mancini is a great coach and he does not seem to be under pressure from the owners of City. Maurinho wants to break the record of Champions League winner with different teams. He has a good chance this year, last year was denied with referees favouritism to Barcellona ( go and watch the games again please) but this year he has a better team and more in shape. Then he will leave and will join Man. Utd. a ready made team with some tweaking to win again the Champions League with a different team. Again I remind you to write some articles on Barcellona theatrics and referees favouritism. Winning and not winning are two sides of the same coin. You win some and you don't win some. Even powerful mortals tend to agree to such hard truths. In life one needs to keep going come what may. Often success is just round the corner. Messi is the world's best player but his right place is at old trafford. So come on Messi, it's now or never. If only Real Madrid could be patient. One thing I know is that it would be really difficult for Madrid to win anything as long as Barca is displaying such great football ,piling pressure on Jose is no solution another thing I know is that Barca won't stay on top forever this is their time and it will pass and when it does I'll be hoping that Jose would still be at Madrid ready to take over.This will only take patience something most clubs don't want to hear, anyway whatever happens, happens .I must also mentioned that you made my day when you wrote how Macini is gonna be fired after he fails to win the premier league .I must say I like your predictions this time round. how can any one consider mourinho a good coach? any bet :manchester united will never take him. Guys,maybe my comment seems funny, but trust me he goes strange Russian team Anji. Because Mourinho loves money and huge respect. Anji owner Suleyman Kerimov is ready to do sensation in transfer market. satyam and sam .your comment is very true. 1) for messi MU is right place.2) I consider him excellent coach,but not good human being,coz normal person never consider himself as #1. the real time is showing him what number is his. Real #1 is Gvardiola now.everyone knows that. Mourinho is not a great coach in the world as some other people regarding him, because if he is; he could not run away in England. he could have stayed and prove himself for the next season. think of when he was in Italy after wining champions league and the league he left, why? He is a great coach. Even great coaches sometimes cannot achieve the greatest results. Too many factors in place. Chelsea made a great mistake by firing him. Mourinio himself made a big mistake by leaving Inter. You just don't through away something which is really good, no matter how great you are. It may not work elsewhere. My bet – Chelsea will hire him back. You cannot walk into the same water twice, however. So it may or may not work. It has been sometime since i have commented on someone elses work, luckily this is positive though. Great post, i is going to be reading this blog far more within the future. JM will lift La Liga and champions League this season. He will only stay in RM when Sargio Ramos and I. Casilas is shipped out. They are being used by Madrid Aristocrates to destabilize JM's dressing room in order to shame him. But they will fail. JM, special and the best of all times.